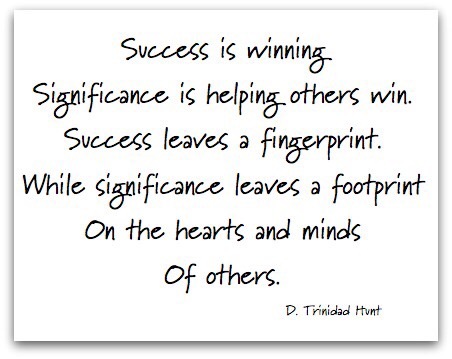 I think about and discuss a lot with team members about the idea of being significant versus successful. We tend to spend so much time striving for success; position, salary, deals, great education, degrees, et cetera that we forget about being significant. Significance is really about extending the reach of our leadership far beyond ourselves. I am working very hard at this point in my life to make everything I do about lifting others up and helping them reach the personal goals and peaks of their professions they are striving for. This in turn will create another generation of leaders to be significant for others. This would be a pretty ok legacy, don’t you think? Leading your organization is about extending your leadership reach beyond yourself and your team to a degree that’s much further from you yet still critically connected to your organization’s center: you. We must grow our impact on the organization through key mindsets, strategic practices, and supportive habits you adopt, implement, and execute. There must be an alignment of values and people. We need to lead a culture of excellence creating an empowered organization of people who, led by you, believe in their organization enough to do their jobs well and build relationships with the customers who will support it. Significant leaders accelerate influence and expand their reach. One way I have found to lift others is to, what I call, hyper-personalize their professional growth opportunities. Just as companies are paying more attention to customer profiles and interactions as they begin to chart out ideal buyer personas for future engagement allowing marketing teams to send out the right message at the right time to the right person, leading to more sales; we need to do the same with those we lead. We must focus on defining the individuals on our teams, their likes and dislikes, and most importantly their issues, challenges, areas in need of growth, and areas of desired,personal/professional growth. By understanding these intricate details, you can get an in-depth look at the individual, and also the factors that affect their personal and professional journey. Are you playing a significant role in the development of those you serve?